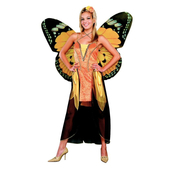 Fantasy Butterfly costume includes a front laced corseted halter dress with a tiered and ruffled skirt with a black lace bottom ruffle with white polka dots and garter straps. 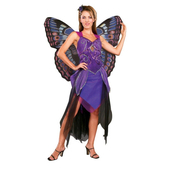 Also included is a pair of butterfly wings and a matching headpiece. 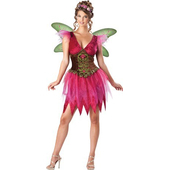 Please note stockings are not included but may be purchased separately.